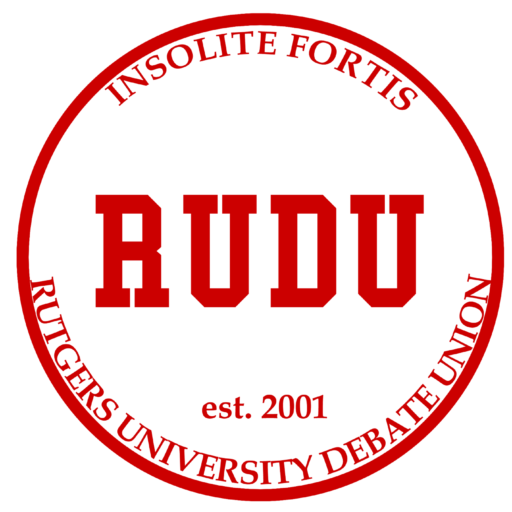 The Rutgers University Debate Union (RUDU) was founded in 2001 and is a full member in good standing of the American Parliamentary Debate Association (APDA). APDA is the elite league of intercollegiate parliamentary debate, comprised of nearly all of the top-ranked colleges and universities on the eastern seaboard, as well as some additional western schools. Notable participants include the entire Ivy League, Stanford, the University of Chicago, MIT, Johns Hopkins, Duke, Swarthmore, Williams, and Amherst. Competitions take place nearly every weekend throughout the academic year, from September through December in the fall and January through April in the spring, culminating in an annual National Championship. An additional North American Championship, a joint competition between APDA and CUSID, the elite Canadian parliamentary league, is held each January. More questions? Click here for our FAQ! We are the Rutgers University Debate Union, an organization committed to the expansion of each member’s general breadth of knowledge concerning political, social, philosophical, economic, and cultural issues. 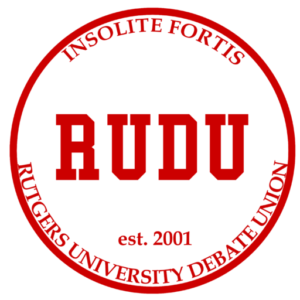 RUDU holds weekly meetings of Rutgers team members in order to prepare the team for intercollegiate competition with other colleges and universities within the American Parliamentary Debate Association (APDA). What happens in your weekly meetings? We hold lectures, drills, and seminars to improve debate skill and strategy, sign up for tournaments and discuss team business, and close with practice rounds. Our practice rounds entail a rigorous pursuit of perfecting rhetorical exposition, as well as quick thinking, logical analysis, and eloquence in speech. RUDU meets every Tuesday and Thursday at 9pm in room 212 of the School of Communications and Information next to the Alexander Library. Check our schedule for details! The American Parliamentary Debate Association (APDA) is a student-run league consisting of over 50 collegiate institutions throughout the nation that encourages the development of argumentation within the guidelines of parliamentary debate format. What is parliamentary debate? How is it different from policy debate? Parliamentary debate focuses on the ability of its participants to quickly think and effectively communicate a logical argument in response to whatever case is presented for that round. Topics for debate vary with each round; depending on the specific role assigned to each team, one team must always present a new argument for which the other team must be aptly able to respond. In this way, parliamentary debate differs from policy debate, in that each round of debate centers on a completely new topic and analysis stemming from one’s general breadth of knowledge, rather than specific quotes or statistics. What are these tournaments like? Schools within APDA sponsor intercollegiate competitions weekly throughout the academic year. Tournaments, over a two-day period, allow debaters the opportunity to compete against peers outside the Rutgers community. Rounds are judged according to speaking ability, rhetorical style, content of argument, and logical analysis. Debaters are then ranked in a power-bracket system, with the two best teams progressing to a final round. How much of a time commitment is this debate union? Meetings and practice rounds for the team are held twice weekly, lasting 4 hours each (but one doesn’t have to stay the whole time). Tournaments begin on Friday afternoon and last until early Saturday evening. Attendance at practice rounds is mandatory for those who wish to participate at tournaments that weekend. Members are also expected to develop viable cases throughout the week for critique at practice rounds, and eventual use at tournaments. None. As a recognized organization of Rutgers University, RUDU can accommodate for any fees and dues requested by the APDA league.